A Laysan Albatross, image from Wikipedia. What Makes a Bird a Seabird? All birds (class Aves) are endothermic (warm blooded), covered with feathers, have wings (of some size), beaks, and claws. Seabirds are distinguished from other birds by the fact that they make their living on the open ocean, and outside of nesting, have no attachment to land. Some seabirds, like the Laysan Albatross (pictured on top) are extraordinary flyers. When juvenile albatross take flight for the first time, they may not set foot again on land until they reach reproductive maturity (as many as 10 years later). Other seabirds, like penguins and flightless cormorants, have completely lost the ability to fly but thrive in the oceans, because their heavier bodies and shortened wings make them accomplished swimmers. The bones of most seabirds are hollow. This makes them both very strong and lighter than mammal bones. Being lighter makes flight easier. Penguins and other diving birds are exceptions to this rule. Penguins don’t fly and pursuit divers, like the now extinct Great Auk, have heavier, denser bones. Nearly all sea birds breed on land. Prime breeding locations are often remote islands and steep cliff sides: locations that were historically free of egg predators. They form dense breeding colonies, with hundreds or thousands of birds packed together in a small area. Almost all species of seabird lay one or two eggs with both parents assisting in feeding the chick. Many seabirds, like the Waved Albatross or the Christmas frigate bird, have elaborate courtship rituals. They are a long-lived group (e.g., Albatross can live more than 80 years) that reach reproductive maturity late in life and have low overall reproductive rates. Seabirds are not to be confused with shorebirds, like the Red Necked Phalarope, that feed and nest on the shoreline. The contour feather of a guinea fowl, image from Wikipedia. Feathers are one of the defining characteristics for birds. There are several types of feathers. Contour feathers are large feathers used in flight. They can be highly modified in diving birds like penguins or auks. Downy feathers are short, soft, and fluffy. They serve to insulate a bird against the cold and provide a bird the buoyancy required to float. Downy feathers have a fantastic ability to trap air. It is for this reason that we like to make winter coats from downy feathers. Powder feathers are used to repel water. They are often coated in a thin layer of oil that helps to keep the other feathers dry. In order to maintain this oil layer, sea birds must regularly preen their feathers. This behavior also cleans the feathers and helps to maintain their insulative value. Click to see a bird preening its feathers. Most seabird feathers are drab in color, with some combination of white, black, and grey. Brighter colors may appear on males during the breeding season, but the drab colors have their advantages. Seabird’s dark backs and light bellies make them less visible to prey underwater. Seabirds have high metabolic rates. Birds don’t have the advantage of size, like many marine mammals. In combination with downy feathers, it is their high metabolism that helps keeps them warm. Birds must maintain warmth in order to use their flying muscles. Much like an athlete trying to perform before they have properly warmed up, cold birds often struggle to fly. Seabirds also have a one direction flow, four chambered heart, much more like mammals than their closest relatives, the reptiles. Four chambered hearts are very efficient at delivering oxygen and provide a greater aerobic capacity. A seabirds remove salt through a specialized gland, the salt then runs down a groove on its beak, image from Birdnote. Most seabirds will participate in long seasonal migrations. In fact, the migration of the Arctic Tern, is the longest migration of any species on Earth. As such, seabirds have excellent eye sight, but they are also aided by a special “sixth sense” that allows them to sense magnetic fields. They use this sense like a compass. This combination of eye sight and magnetic field detection helps them to navigate over long distances and return to the same breeding colonies where they were born. Surface Feeders collect items of food floating or swimming at the surface. Click to see a Wilson’s Storm-Petral demonstrate surface feeding. Plunge divers will fall from impressive heights and dive into the water to obtain food, swimming below the surface. Click to see a group of Gannets plunge into the water to capture prey. Pursuit divers, like Puffins or penguins, use their wings and feet to fly or swim pursuing their prey underwater. Scavengers are birds like Skuas, Jaegers, Gulls, and Frigatebirds that feed largely on the wing, stealing the food or chicks of other birds. Seabirds drink salt water. This would quickly kill you and I, but seabirds have special glands to help them remove excess salt. The excretions from these glands at the nasal cavities, looks like a white “snot” but is almost pure salt. There are seventeen species of penguins, and each one of them is remarkably interesting and fun. They reside completely in the Southern Hemisphere; from the Equator to Antarctica. Many people are surprised to learn that penguins are birds. Like all birds they have feathers, beaks, claws, and a warm blooded metabolism. Penguin feathers are smaller than most other birds, and they have more of them than most other birds— nearly 71 feathers per square inch. 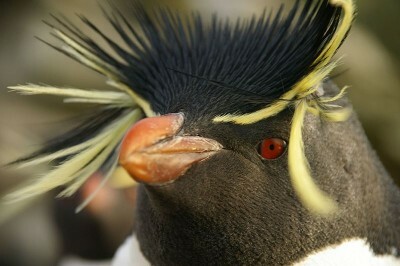 In order to maintain their value as water-proof insulation, penguins must constantly preen their feathers. A gland near the base of a penguins tail, secretes oil that a penguin will use to coat its feathers. Most birds have hollow bones, but penguins do not. Their small wings and high body weight make them unable to fly, however their large muscles make them great swimmers. Like many fish, all penguins are dark on their backs and light on their stomachs. This “counter-shading” helps to camouflage them in the water. Penguins breed largely on predator free islands. Some make nests in underground burrows, some in above ground nests, and still others make no nests at all, holding the eggs on their feet instead. Almost all seabirds lay their eggs on islands or in cliff sides. Historically, these were locations safe from nest predators. However, the introduction of non-native species (many of which are nest predators), has become the leading cause of sea bird decline. Introduced cats, rats, and (in Alaska) foxes have devastated many seabird breeding colonies. You can also click on the link to see what it looks like when a group of introduced mice try to eat an albatross chick alive. Unintended bycatch of sea birds by fishing vessels has been a big problem for lots of sea bird species. Sea birds often follow long lining boats, trying to pull bait off of hooks, and inevitably many birds catch themselves on the hooks are dragged down into the depths and drown. Efforts have been made by the Alaskan long lining fleet to reduce bycatch. Simple technical changes, called streamers, that scare birds away from hooks or weighted lines that sink hooks quicker have had some success in reducing bycatch. Click on the link to read more about how long-line fishing threatens seabirds. A dead Laysan Albatross filled with plastics, image from Arkive.org. Bird feathers are a wonder. Make a sketch of a contour feather (showing its leading and trailing edge) and a downy feather. Seabirds like to nest on cliffs. Assuming it’s day time and the camera is up, check out the live camera on the seabird colonies of Anacapa Island in Southern California. Select one of the species nesting there, and tell me a little bit about it. Watch some of the video clips in the feeding section. Write a brief description of and give an example for: surface feeding, plunging, pursuit diving, and scavenging. Listen to the BirdNote story on how birds are able to drink salt water and summarize what you learn. The great ornithologist Scott Weidensaul has said that “Bird migration is the one truly unifying natural phenomenon in the world, stitching the continents together in a way that even the great weather systems, which roar out of the poles but fizzle at the equator, fail to do.” Recently scientists have revealed the longest sea bird migration ever recorded. Read the article and describe the migration of the Sooty Shearwater. One species that is not migratory is the rhinoceros auklet. Read the attached story and describe why scientists find their populations to be a good indicator of ecosystem health. If you want you can also check out the video of the rhinoceros Auklet nest. The northern hemisphere has no penguins. However, members of the family Alcidae or “Auk” are superficially like penguins in many ways. When two unrelated groups of species evolve similar traits, it is called convergent evolution. Click on the link to the Alcidae link, and find out what characteristics they share with penguins. Explain how toxins from plastic pollution is being passed on to other species through seabird poop, even in pristine Alaska.